The fact that the CPM general secretary put his job on the line to ensure the adoption of his draft reflects his maturity and resolve. 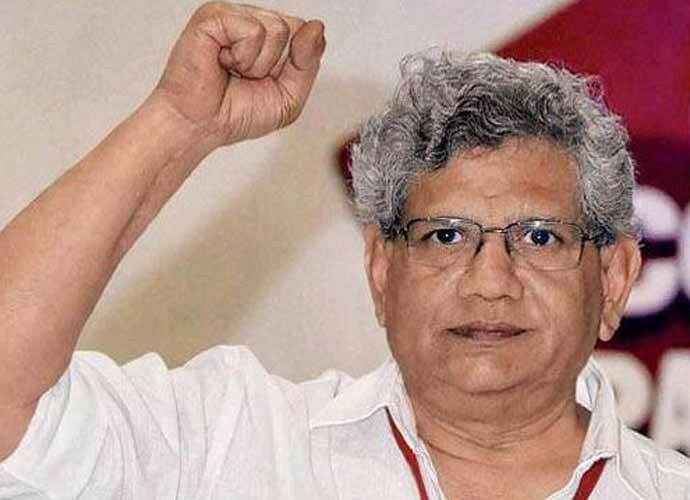 The Communist Party of India (Marxist) elected Sitaram Yechury as the party's general secretary for a second term at the party's 22nd Congress that concluded in Hyderabad on Sunday. Although it was assumed that Yechury would get an extension after his political line prevailed against all odds at the party Congress, it wasn't without hiccups. It also came after months of wrangling on the draft political resolution. Not so long ago, at the CPM Kerala State Conference in February that was a prelude to the 22nd Party Congress in Hyderabad, Yechury came in for scathing criticism from the Democratic Youth Federation of India (CPM Youth Wing) national president Mohammed Riyaz and state president AN Shamseer for what they saw as his soft stance towards the Congress. In his reply, Yechury weighed his words carefully as his wont and asked the hot-blooded young comrades to get better acquainted with the party programme before targeting him on the basis of press reports. He followed that up by quipping that CPM does not stand for Communist Party of Kerala (Marxist) and it cannot draw a political-tactical line based on the imperatives of one state unit. Yechuri's growth in the party has been steady ever since he got elected to the CPM central committee in 1984 and the politburo in 1992. Though he was a contender for the post of general secretary in 2005, Prakash Karat pipped him to it and he had to wait a decade to get another shot at it. Even in 2015, at the 21st Party Congress in Visakhapatnam, it wasn't a smooth passing of batons. The Kerala unit had propped up veteran S Ramachandran Pillai for the post and only some hard bargaining and the venue being his home state ultimately ensured Yechury's election. In the past six months, the alternate draft resolutions prepared by Yechury and Karat had become a contentious issue. In the central committee that met in January, Karat's draft was finally adopted to be sent to the party Congress and to be circulated among the lower committees. A determined Yechury never gave up and said that amendments to the draft could be made in the Party Congress if the majority of the delegates backed it. The 664 delegates, bulk of them from Kerala and West Bengal with 175 delegates each, rallied behind Karat and Yechury, respectively. It was down to state units of Tamil Nadu, Andhra Pradesh, Telangana, Tripura and other states with fewer delegates. It seems Yechury had already explored ways to ensure that his draft was ultimately accepted by the Party Congress even if it came in the form of amendments in Karat's draft resolution. Although it seemed impossible that any such thing could actually happen - since most of the delegates from Andhra, Telangana and Tripura backed Karat - Yechury coordinated with the delegates from states with fewer representatives and got 16 state units to collectively demand for a secret ballot. This gambit took the Karat camp by surprise. Despite Karat's contention that no such provision for a secret ballot existed in the party constitution, Yechury camp quoted Jyoti Basu from the 14th Party Congress - that the party constitution could be suspended for the duration of the Party Congress. Even the Kerala unit - that had coordinated among themselves to ensure their votes didn't split despite a tiny minority backing Yechury's line -sensed trouble when the demand for a secret ballot was invoked. Finally, a compromise had to be reached behind closed doors in the politburo to delete a sentence in the political line that forbade the party from reaching any "understanding with the Congress" along with other minor changes. Although initially everyone played down the possibility of a change of guard, it became evident that the Karat camp was exploring the possibility of dethroning Yechury after the election of the fresh central committee. As the matter came up for discussion in the politburo that met on Saturday (April 21) morning, S Ramachandran Pillai is reported to have mooted the candidacy of presidium chairman Manik Sarkar for general secretary. To which, Yechury is reported to have replied that it would be ideal if someone else were to contest against him as Sarkar's successful election would send a bad signal to Tripura's electorate in the immediate aftermath of the election held there. 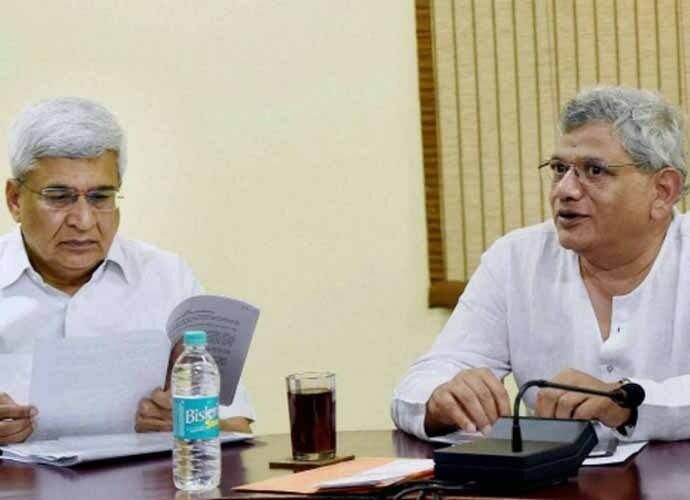 With Yechury's determination to fight it out becoming evident, Karat and the Kerala unit backed out. The fact that Yechury put his job on the line to ensure the adoption of his draft reflects the maturity and resolve. Yechury's doggedness to stand ground was in the greater interest of the nation at this critical juncture and not for short-term goals like some of the others in the Karat camp. Unlike his immediate predecessor, Yechury has been active and vocal both inside and outside the Parliament to emerge as a worthy leader of the secular forces. Despite the failure in Tripura and the spate of desertions in West Bengal, he has been marshalling his troops to punch above their weight on a consistent basis. Yechury is conscious of the acute importance of the Left forces in preventing the reactionary forces from gaining further ground. In the end, better sense prevailed and the party Congress could project a picture of unity to paper over all the factionalism at play. It's probably the factionalism in the Kerala unit, which goes back to 2003 - pitting then state secretary Pinarayi Vijayan with his one-time mentor VS Achuthananthan - that ultimately set the stage for this. After losing his clout in the state committees, VS Achuthanandan had long depended on the backing he received from Yechury to keep his head out of water. The decision of the Bengal unit to enter into an understanding with the Congress in West Bengal for 2016 Assembly elections further exacerbated the schism that existed between the Yechury camp and Karat camps. In a way, Yechury is the ultimate survivor and the true inheritor of the mantle of Harkishan Singh Surjeet. Surjeet's pragmatic approach was instrumental in the formation of the National Front government of VP Singh in 1989, the United Front governments in the mid-nineties and lastly, the Left-backed UPA government in 2004. With the likelihood of the next general election being fought between the demagogue on side and a clutch of Opposition parties on the other, a resolute Yechury would be the perfect foil to the centrist forces leading the charge.